In 2010, close to 5,000 people were killed in motorcycle accidents. Over seventy–five percent of reported motorcycle crashes result in serious injury versus twenty–five percent of automobile crashes. As skilled Chicago personal injury lawyers we have handled many cases involving motorcycle crashes. Motorcycle accidents often end in catastrophic injuries or death. Other injuries injuries suffered include broken bones and burns, limb amputations, road rash, facial fractures and disfigurement, spinal cord injuries, paralysis and Traumatic Brian Injuries (TBI) and death. Motorcycle accidents are unique and require an attorney who has experience handling these specialized cases. Nemeroff Law Offices has experience representing victims of motorcycle accidents and can maximize the compensation the driver may be entitled to. 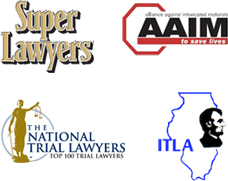 Our Chicago motorcycle accident lawyers are available for a free office, hospital, or home consultation.